← Mike, me and two dead bodies. We suffered through an epic fourteen hour journey from Agra to Delhi to Chennai (Madras for you Anglophiles) to Kochi (Cochin) in the far southwest of India. It was at Kochi Airport that our Indian Odyssey suddenly became easy. No more squeezing overweight bags and two overfed Australians into the impossibly small cabin of a tuk tuk (small three-wheeled vehicle with a lawn mower engine); no more fighting with bags as we ran up and down stairs to get to the correct platform for the next train, dodging beggars and the people of India on the move. On arrival at Kochi Airport, a very smartly dressed man was waiting with a sign that read “Mr Richard – Raheem Residency”. An air-conditioned Toyota Pajero was our steed that swerved for two hours through the usual traffic chaos, monsoon rain and a dark Kerala sky occasionally lighting up in glorious flashes of lightning. More luxury awaited us. (Remember our accommodation in Agra?) We earned it and needed it! The Raheem Residency is a small hotel in a 150 year old Portuguese colonial mansion. Picture antiques, stained glass windows, polished teak floors and ceilings, the quiet sound of the ocean – and a clean bathroom! Consequently, we spent the next two days lazing around the courtyard pool, having massages and walking with the locals along the beach. Sounds like heaven – want to be there? Just ask me; I’ve got the address. The Residency is in a small Portuguese town called Allepey. It used to be a major port on the Portuguese Spice Route, but after Cochin stole that mantel it’s turned into a quiet little fishing village with remnants of its colonial past. Churches, colonial architecture and canals (the Dutch and British also had an influence). Speaking of which, did you know that after the Brits gave India independence, the Portuguese held onto this territory for approximately another fifteen years? Residents held Portuguese passports, which they had to use when travelling to the rest of what we now know of as India. So we have pried ourselves off the sun lounge and away from The Raheem Residency, and are now moored to a coconut tree next to a rice paddy in the backwaters of Kerala. We have rented a two storey houseboat, complete with jacuzzi and three staff. In fact, we booked the “honeymoon package”, as it’s the only two-night deal I could find on the various websites. Can you imagine their surprise when we turned up. Anyway, the boat is a thatch-covered long boat with a steel hull and teak interior. We have a chef (well a guy with a heavily stained chef’s jacket), a skipper and an engine operator. We don’t do things by halves; it’s our big splurge for the trip. 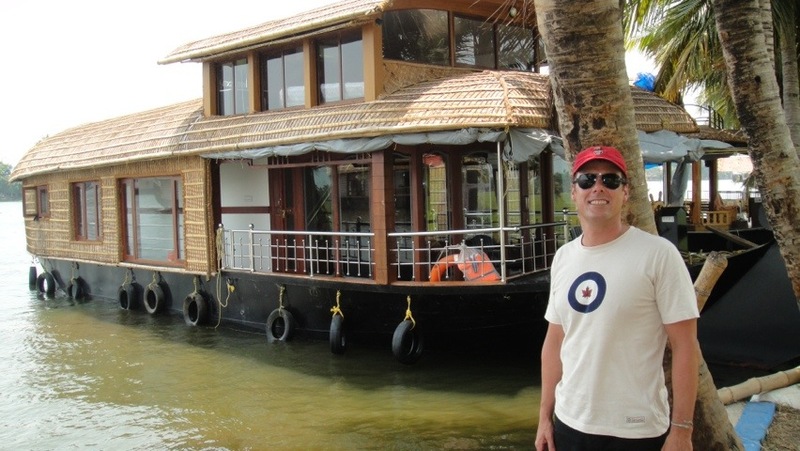 The backwaters of this region are a maze of canals and inland waterways that lead off an enormous lake. The waterways are lined with coconut palms, water lilies, rice paddies and villages that hug a narrow path along the waters edge. The water is their roadway. Tearing down to the local shop or going to school involves a boat. The wildlife, apart from the local kids swimming and washing in the water, includes water snakes (apparently not deadly, although I’m not game to try this theory), water birds, kingfishers, goats, ducks, I’m sure water rats, crabs, prawns, fish, cows and the ever-smiling and waving local people. At one stage we saw the most amazing duck stampede. Now I know I might exaggerate every now and then (purely for effect). However, imagine thousands of ducks pouring over the the wall of the canal, following a duck ‘jackeroo’ in his canoe. 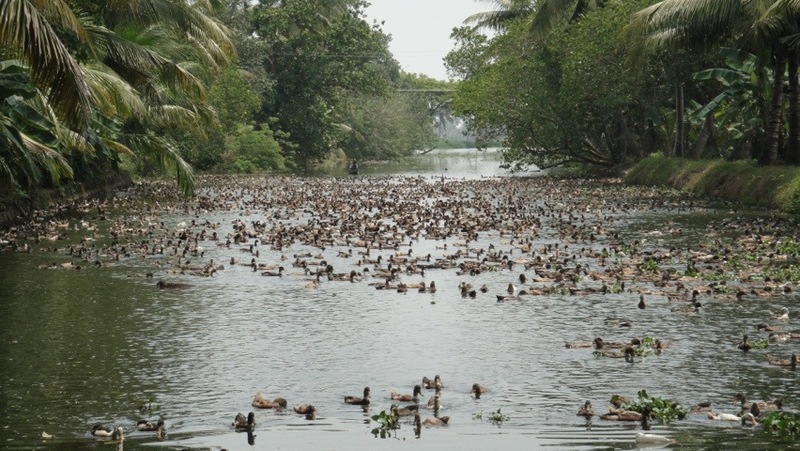 The sight was like watching lemmings en masse; just when we thought there couldn’t be any more, I looked across into the rice paddy and there was a stream of ducks about twenty abreast as far as the eye could see. All quacking away in Indian, with their heads wagging from side to side. All right – that might be a bit of an exaggeration, but their was some serious quacking going on! Now it’s just the sound of the birds and the gentle breeze through the coconut palms as evening descends in the Kerala backwaters. After the crazed lifestyle of horns, tuk tuks, motorbikes, bicycles, trucks, goats and cows on the streets of North India, this is just the tonic my frayed nerves needed. This entry was posted in India and tagged India, Kerala. Bookmark the permalink.